Smartphones have become multipurpose handheld computers used by a significant percentage of the population. The newest operating systems and apps allow smartphones to interact with many different types of devices both online and through local wireless protocols. This includes many modern systems in the home. Smartphones can help to integrate a home in four cool ways. Smartphones are making it possible to integrate and control entire entertainment systems in the home. New wireless components and wireless controllers can now communicate with phones through different apps. This includes televisions, media players, speakers and even new gaming consoles. A smartphone can become a universal remote. They can also add functionality. Some setups allow the smartphone to act as a gateway to streaming media online or personal media libraries that can be outputted to the entertainment system. The newest home automation systems like those available through Vivint in Muskogee, OK are capable of fully interfacing with smartphones. The automation system can control the basic infrastructure of the home from the thermostats to the lights. 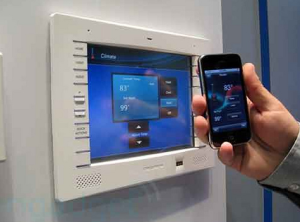 Some setups include wireless locks, energy savings features and control of electrical outlets. The smartphone shows real-time data and includes features in an app that allow homeowners to control parts of the house from any location. A new generation of appliances can talk to smartphones. Appliances like ovens or washing machines can send alerts when a laundry cycle is done or when food reaches a certain temperature. Appliances like refrigerators or dryers can send alerts when parts stop functioning correctly or when filters need to be changed. Homeowners can keep track of the state of these appliances through a smartphone even from outside the house. Smartphones are making the idea of a smart home that responds to simple commands from anywhere a reality. The phones are powerful enough to run complex applications and process large amounts of data from automation and security systems. Homeowners will likely soon see many next-generation wireless appliances and components for the house that interact in new and exciting ways.